This little rabbit followed K home from the garden show! 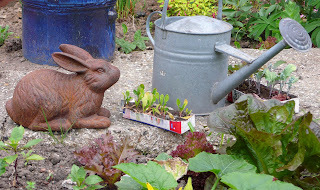 He is enjoying eating my spinach, which needs planting,and my lettuce. He has not met Captain Rupert yet but I'm sure they will have a great time together, eating all my plants. Thank you to everybody who came and chatted to me at the show. I met some really lovely people, it was lovely to hear peoples comments about my paintings and I have come away with a lots of new ideas. K was a fantastic help to me again. 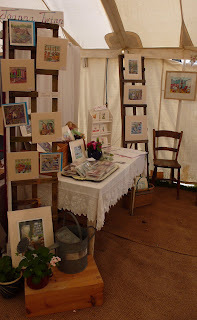 We arrived on Thursday night with my little tiny car full of cards and tables and bunting. It all looked a little lost in the space, which was bigger than I thought, so we rushed home and found some trellis kindly left behind by the last occupant of the house and some extra flowers and things. A early start on Friday morning to add the extra things to the stand. I was very pleased with the look in the end. Again I will post the painting here soon that I was painting at the show. I have two tickets to the Garden Show at Stansted house, I have linked to the post below. Its on friday, saturday and sunday there is lots to see and do including lots of gardeny things, craft tent, art tent (which I will be in) and much more. I have been thinking about who would make best use of them and have not been able to decide. So I thought I would offer them here. If anybody could make use of them please email me, if not I will have to keep thinking. This dog has a few of his old favorite things, so I think I might call him old favourite or old faithful undecided at the moment. I was painting him at the trade show and finally got him finished in Italy on our recent trip there. 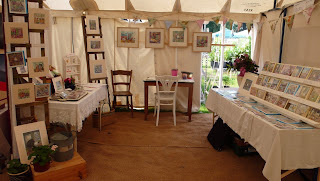 We are of to another show at the weekend The Garden Show at Stansted house. If anyone is passing by please come and say hello. Its a local show, which is great to be able to come home at night. I'm still very worried about doing shows but trying to be brave. 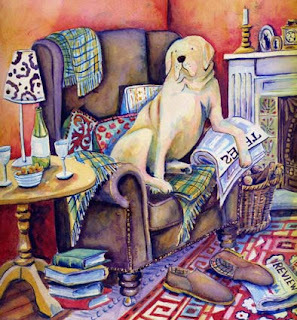 Captain Rupert has been enjoying loads of freedom running around the garden while I have been busy sorting out orders. He has been moaning why have I not been outside with my camera taking pictures of him. He wishes he could have some of his rabbit friends over for tea to share it with. espiecally the ones who have not got a garden of there own. I'm slowly winning the war on the ground elder but have started to do battle with the bindweed. Which I think is much worse. I have dug up as much as possible for now, keeping an eye out for any new shoots. I have not been very green fingered recently, my tomato plants have gone leggy and the slugs have eaten most other things. There are a few things left, I will have to do as Captain Rupert says and get the camera out and take some pictures.